The rich chocolate brown hues of its heartwood make the American Black Walnut lumber a rare jewel that shines and shimmers among the many woods that make up the domestic hardwood industry. 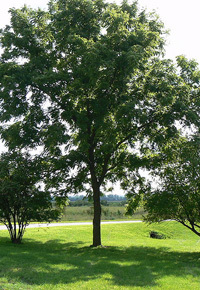 Growing plentifully from Southern Ontario down through the Eastern United States, the Black Walnut tree grows as far west as Iowa and Missouri and reaches heights up to 150 feet. These trees have trunks as wide as 6 feet in diameter and produce tasty nuts, natural dyes, and—of course—the deep brown wood. The prevalence of walnut lumber made it a wood of choice for furnishing colonial American homes. In fact, before the revolutionary war would create an independent nation of the colonies, millions of walnut trees would be harvested for domestic use. Cabinet makers were soon to fall in love with the wood, as well, prizing its swirling grain and even texture, along with its dark brown shade. 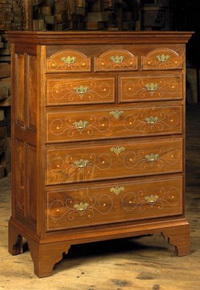 As a result, many antique furniture pieces that date back to early America were crafted from Black Walnut. 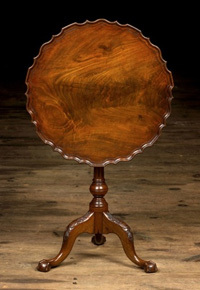 Of course, connoisseurs of American antiques aren’t the only ones who prize the dark brown domestic wood, today. In fact, one aspect of the popular Pottery Barn look relies on mixing a few “found” items—such as real antique chairs or bookshelves—with new furniture reminiscent of such pieces, but with a modern flair. While exotic hardwoods no doubt play a part in this transitional look, so does Black Walnut. The coloring of Walnut lumber is such a deep, rich shade of brown that it can be mistaken for black in low lighting; such is the characteristic of the popular finish referred to as “espresso.” Of course, an espresso finish can be applied to almost any wood, but its popularity bodes well for Walnut, whose popularity waned for a couple decades, in favor of lighter woods, like Oak and Cherry. Still considered “America’s premier cabinet wood” by some, this wood is coming back in the form of furniture and hardwood doors and flooring, as well. Additional uses of the wood throughout the years has included World War 1 airplane propellers as well as gunstocks, caskets, and paneling throughout high-end estates. Stronger than oak, this versatile wood is easily machined due to its mid-grade hardness. While Black Walnut is well known for its rich, even brown color, when it is freshly milled, it reflects a variety of browns, purples, and creams. The steaming process evens out that spectrum, though, creating a more muted, even hue. Time and oxidation, along with exposure to UV rays, tends to lighten Walnut, making it appear more similar to other domestic lumber types. J. Gibson McIlvain, a nationwide lumber wholesaler (website), carries an assortment of steamed Black Walnut that has unmatched consistency and attractive coloring, along with a uniquely wide lumber assortment that’s sure to meet your particular needs.